Pantry staples combined with a few fresh ingredients…I usually have a sweet potato or two kicking around in the pantry and couscous and cans of black beans always. Same for edamame in the freezer. And with the last of the spinach from the greenhouse, the abundance of mint out in the perennial bed and a smidge of volunteer basil we had in the greenhouse (it had self-planted into one of the citrus pots), I created this colorful, super healthy salad. So much fresh flavor going on in this oil-free, plant-based salad! Whisk together all dressing ingredients together and set aside. Gently stir all of the salad ingredients – except the spinach – together, then add the dressing and stir again. Divide the spinach between four big plates or bowls and top with the salad. For a quick side dish, I mixed together a splash of vegetable broth, soy sauce, white miso paste, ground black pepper and a clove of garlic (minced) and tossed in two sliced two zucchinis. Baked it at 425F until the zukes were tender (turning now and again). Pretty durn tasty. Love all the fresh ingredients. 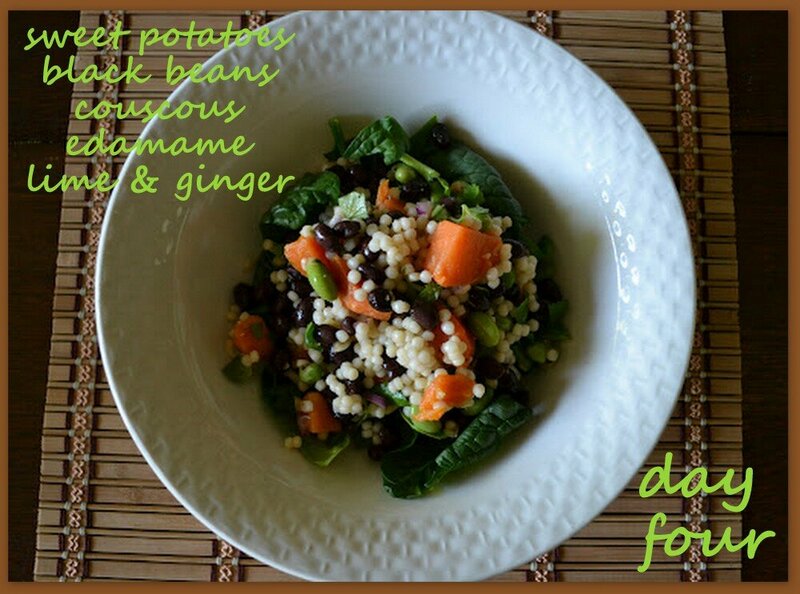 I am loving your 7 Days of Salads! Brilliant! Wow, thanks Holly! That is so cool! Loving this salad today! Looks delish – that couscous is a nice touch! I totally love sweet potatoes and couscous together! Yum – you are a true salad master! Yesterday I made your Orzo salad and it was delicious! Your salads look so beautiful! This one is so colorful and your orzo salad from yesterday looks divine as well! awesome salad lady! sweet potatoes in salad are pure amazingness! Holy moly! Thank you, thank you! What a sweet treat! Oooh! That dressing sounds amazing! I kinda want to make it and put it on everything. And the photo of the limes and ginger is beautiful! Exactly! I felt the same way! I love this, and everything you cook looks so delicious! Thanks for giving us so many great ideas. Yeah, we put it up this past winter – it’s wonderful. Had fresh greens even while it was cold outside. Now we have tomatoes, peppers and carrots in there – plus some basil we deliberately planted ;-). I think I have to just so I can call it a Saladeria! Love this salad so by far – all my favourite flavours and ingredients! One word “Yumm.” Seriously… I’m eating this as I type. I made last night for my lunch today. This is really good. I love your tasty & alternative dressing a lot here! So flavourful!! We made this for dinner last night. Delicious!